We are pleased to announce that we are in the process of building out our new state of the art office building in Englewood Florida. Project completion date is estimated to be January 1st, 2016 just in time for the busy winter season. Program's new luxury offices will be located off South Access road in the Rubbertree Shopping plaza. Once complete, this new Program Office will be the most modern and upscale real estate office in the entire Englewood area. 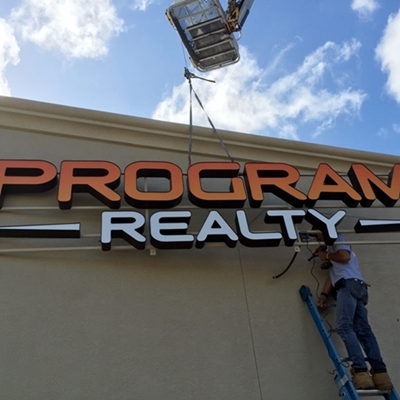 This gorgeous new office has a great centralized location allowing Program Realty associates to cover the sales areas from Punta Gorda to Venice and all points in between with superior real estate service. This new office location will be sure to impress with its many upscale and green features. Agents will have access to private offices, cubicles, and two private meeting rooms to meet with clients. These new meeting rooms will feature 60 inch LCD televisions connected to networked MLS computers where the agent can go through the MLS system home by home, looking for that perfect new property for their buyers. More pictures to come soon! Stay tuned and make sure you visit us this season to take a look!